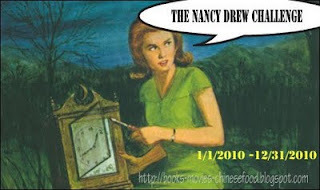 Yesterday I talked about some of my favorite memories of Nancy Drew from when I was growing up, mentioning that it took me some time before I realized that the series was updated every so often to keep Nancy up with the times. Everyone seems to have their opinion over which versions of the book they most enjoyed but for my part, I prefer Nancy of the 1930's. I like Nancy as she was originally written. I know she's not politically correct, up to 2010, but there's a quaint history about her that is genuine and REAL. I don't wish to live in the 1930's but there was a much more straight forward manner of living life back then that is hugely appealing to me. I appreciate her relationship with her father, her attitude of responsibility and self respect and genuine care for others that she shows. I sat down and read The Secret of the Old Clock (1930) and immediately followed it up by reading the 1954 edition of the same title. There is a richness to the 1930 edition that is completely lost by the time 1954 rolled around. As you can see, the family is described by Nancy in a conversation wherein it should have been ridiculous for her to have to inform her father of these facts. He no doubt knew the family for himself and was aware of the fact that Isabel and Ada had gone to school with Nancy. There was no need for the description of the family to fall in quotes. Still, I prefer the 1930's descriptions of the characters which give me a chuckle. In spite of the expensive clothes she wore, she was anything but attractive, for she was tall and slender and to the point of being termed "skinny." Now that her face was distorted with anger, she was positively ugly. In spite of the expensive clothes she wore, Ada was not attractive. She was very thin and sallow, with an expression of petulance. Now that her face was distorted with anger, she was almost ugly. Each decade's retelling of Nancy conforms her to the new standards of beauty and pizazz. She also aged by two years in the 1959+ editions. In 1930 she was a bright 16 year old who was done with school and was a well-kept daughter of a wealthy and influential attorney. In 1959 her father still shows warmth and respect for his smart and beautiful daughter, but she somehow comes across as being less connected to him. However, no matter what the year or the clothes, Nancy has always been a girl that is worth liking because she shows a genuine kindness and concern towards other people. I found her much more easy to identify with and much more responsible as a 16 year old in 1930 than as an 18 year old in 1959 though. There is a greater depth to her, as originally written. She sacrificed more for the needs of others in 1930 than otherwise. As women became more independent, so did Nancy. The original author of the 1930's edition, Mildred A. Wirt Benson, still put Nancy under the care, concern and love of a father, but also gave her gumption. I like a woman with gumption who still sees and feels the need to be respectful towards those who protect her. That's admirable and for any variety of reasons, I just prefer Nancy as she originally was. 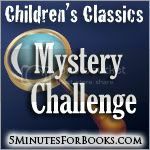 As I participate in the Children's Classics Mystery Challenge, I do intend to spend most of my Nancy time with the original series, as they were, and in all of their glory. I will enjoy myself richly because it really is in the original works that you can truly get to know a character well. If you can scrounge up some Nancy Drew books to add to your collection that are from the original publications, I'd strongly recommend that you do so. Perhaps your opinion differs but -- I can't think that you'd regret it! Interesting, Carrie! Thanks for sharing. I was wondering exactly where the differences were. I like the less sophisticated Nancy, too. Very interesting. I have one of the older Nancy Drew books, but have not yet read it. Most of what I have and have read are of the 1950-ish era. The ones I read were my mom's 1959 (?) versions. Then the 80/90s (?) versions started coming out just as I was really into Nancy Drew. I didn't realize they were just remaking the old ones but I didn't much care for the modernized Nancy. I've never read Nancy Drew, but they did the same thing with the Hardy Boys. Thanks for the evaluation and comparison! I've never read any of the 1930's books (though I think our public library has a few; maybe I'll check for Locket)--but I've been amused by the books I've read so far (#1-3) from the 50's. Like you, I was a HUGE Nancy fan and it's been fun revisiting my old friend! Fascinating comparison! I never really thought about how different the editions might be. The "voice" of the 30's version was more interesting to me, too. I haven't read Nancy Drew in years and years, but it's so interesting to see the differences between the 1930s and 1950s versions. Wow, this is great. I never read any Nancy Drew and it's so helpful to know the differences so I can inform my patrons. Thanks! I loved reading Nancy Drew back in the early sixxties but I don't know when those were published. I just remember how much I wanted to drive a roadster when I was old enough. I have two unread Nancy Drew books on my shelf right now that were published in 2004. I hope they have some of the charm of the original series. Good post! I completely agree.